With Canon and Fujifilm announcing new mirrorless cameras within days of each other, it’s not difficult to see the way cameras are headed. If your bank balance doesn’t stretch far enough for the new Canon EOS R, Fujifilm’s X-T3 could be just the ticket. With its polished design, brilliant AF and pin-sharp 24.3MP sensor, Fujifilm’s X-T2 was always a hit with the most demanding photographers and videographers. Only the lack of a touchscreen and lower ISO sensitivity let it down. With the new X-T3, Fujifilm’s updated mirrorless model for 2018, it is hoping that this time it has thought of everything (and more). 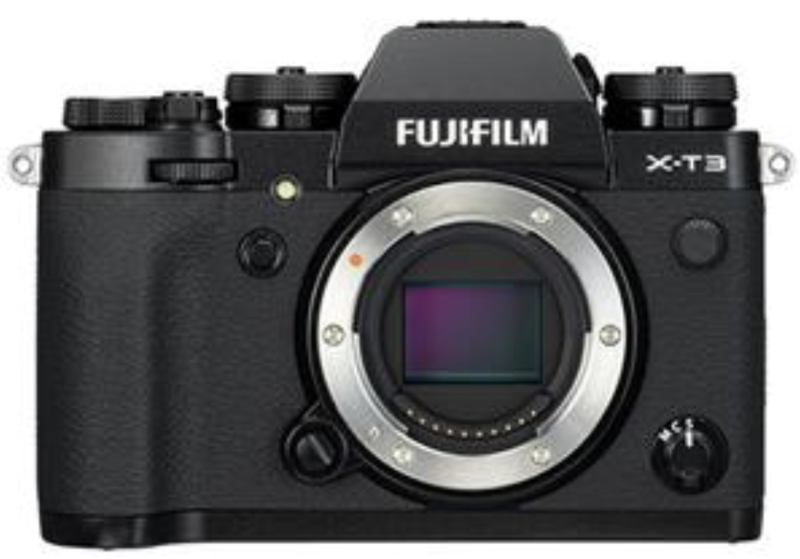 The beating heart of the X-T3 is its new APS-C-sized 26.1MP sensor, a back-illuminated X-Trans CMOS 4 sensor with probably the best autofocus Fujifilm has ever produced. Phase detection autofocus, one of the fastest, smoothest ways to lock on and track focus points, now covers 100% of the X-T3’s frame. The autofocus system itself has an eye-watering 495 focus points (up from 325) and the X-T3 can focus well in low light conditions down to -3EV. Face and eye detection have also been improved. All of this magic is powered by a new X-Processor 4, which can deliver 4K video at 60fps with 10-bit colour. This quad core processor also enables the X-T3 to refocus and read EV values much faster – up to 1.5 times as often at the X-T2. Videographers have plenty to get excited about here. Fujifilm is trumpeting the fact that this is the first mirrorless digital camera capable of internal SD card 4K/60P 4:2:0 10-bit recording. It’s also the first mirrorless camera with APS-C or larger sensor capable of 4K/60P 4:2:2 10-bit HDMI. Oh, and because it’s the little things that can make a big difference, there’s now a built-in headphone jack for monitoring audio. The X-T2’s minimum ISO of 200 has been improved, with the X-T3 now starting at 160 ISO and maxing out at 12,800. For rapid shots, you can shoot at 11fps with the mechanical shutter, or 30fps in burst mode using the electronic shutter (images are cropped in this mode). In-built image stabilisation is still reserved for the X-H1 though. This is a solid, well-made, weather-resistant camera. While the buttons are all in their familiar places, they’ve been made a little bigger and more pronounced here. The 0.5-inch OLED viewfinder has a higher resolution and displays at 0.75x magnification (up from 0.62). Controlling the X-T3 couldn’t be easier either. Its three-way tiltable screen is now a touchscreen, too, so you can tap to focus or shoot. Appealing as much to videographers as photographers, the X-T3 offers something for everyone. With Jessops’ bargain launch price of £1,349, there’s never been a better time to make the switch to mirrorless.